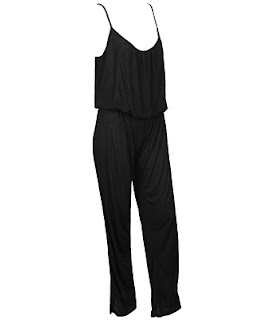 I purchased a black jersey jumpsuit back in April (or maybe even earlier!) for the spring/summer. It hung in my closet waiting to be altered for 2 months (shame on me); I finally had it hemmed about a month ago, and now it's been sitting in my closet waiting to be worn (double shame). It's quite versatile and looks like this one from Forever 21 (I couldn't find the Express version online anymore). I have ideas in mind for wearing it out at night, but here's where I need your help- can I wear this to work? My office is casual, and it's not terribly revealing, but I am just not sure. If so, with what? Style me! Feel free to post links or pics or anything, thanks! I've been obsessed with jumpsuits and exact same way about alterations, LOL.